K for TVB » Blog Archive » [New Series]: Yes, Sir. Sorry, Sir! English Title: Yes, Sir. Sorry, Sir! At present, the triads have expanded their drug network at local schools. WAH, who has turned a cop, is told to go undercover at the school where he used to teach. At school, he is impressed by the enthusiasm of a new teacher HO MIU-SUET (Tavia Yeung). He also comes to realize he was too strict with his students in the past. With a determination to boost students’ confidence, SUET invites bowling expert KOO KA-LAM (Linda Chung) to teach bowling at the school. When LAM learns about her triad background, he decides to go after her hoping to learn more about the triads. LAM also finds himself in a contest of wits with Inspector CHING MAN-LIK (Ron Ng), who has been assigned to work as a liaison officer at the school. On one hand, MAN is attracted to SUET but on the other, she only loves WAH. 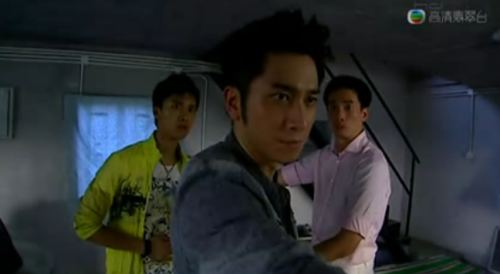 All of a sudden, WAH, SUET, LAM and LIK find themselves involved in a complicated love polygon. Who is your favourite character in YSSS? Reminds me of Kindergarten Cop XD Well..sorta, with the teacher-cop thing but not really. can wait to see this drama!!! moses, linda, ron n tavia rox!!! 😀 yeah!!! yeah I hope they do and they will but just not in this show though. and I agree with some others, Ron hasn’t been on screen for quite a while now and so is Linda and Moses. I can’t wait to watch this drama to come out, I wish it would have been after only you was over :\ I wonder how this love polygon turns out. Can’t wait!! yes i read that they will be pairing up in dwelling of men and women? but they wont end up together 🙁 i think..? i also cant wait to see moses as a teacher i think this be pretty interesting plus the love ‘polygon’ lol. So is Ron and Linda going to get paired up in this series? Or is it Moses and Linda? so it is true that towards the end linda will not get paired with anyone? same goes for ron too? well we have to watch the show to see. I think Moses and Linda will get paired up at the end and Ron gets paired up with Tavia. I only wanna watch this for Ron and Linda. Haven’t seen Ron for a long time, the last time I saw him was in OL Supreme where he plays this cute nerdy guy and a couple with Sire Ma. I’m tired of seeing Moses and Tavia onscreen! Linda’s face looks weird in the poster and Tavia really like her pixie cut eh lol. & really? Linda not getting paired up with Ron? Booo lol. I can already see Tavia and Moses together (not to mention people like them as a couple from previous series) so no chance for Linda there. Yeah I wish Ron and Linda gets paired up. Linda might have a chance to get paired up with Moses like in Heart of Greed so you wouldn’t say she has no chance. And Ron probably has a chance with Tavia ever since they got paired up in The Academy. Both Ron and Linda did not make their appearance yet in the first 3 episodes. nor in the fourth. sigh wonder when can get to see them. OMG!!! i just finished watching ep 5 and RON is OUT!!! at the last few mins of the ep! YEAH!!! Don’t give up on the series, it gets better later on. Yep, I agree with you this time. When I started this series, I got annoyed by Moses, but it gets better as Ron appears. I heard it’s going to get really interesting when Linda appears 🙂 I’m up to episode 17 of Relic of an Emissary and episode 9 of YSSS. Hey K! I watched the first episode of YSSS. My thought: This show is so stupid, I like Shine on You better than YSSS but I also thought Shine on You was boring. This story is sadly only so-so for me at the moment, not too fond of Moses’s dotty roles ^^; The way he behaves and his animated facial features make him seem dumb :/ Then we have Tavia who is playing the typical goody-goody righteous roles..*sigh* Hopefully it gets better. yeah, I really like how she rolls. This show really gets better as it goes along. Ok maybe its too early to tell, but once Ron and Linda appear, really, things get better. Gotta admit it’s a bit slow and sometimes I wonder what the climax of the story is going to be though. I see your point. Right now, I’m up to episode 17 of the show and I feel like it’s better than Relic of Emissary. So don’t give up on the series, it’s not a waste of time to watch it. I was watching both Relic of an Emissary and YSSS. After episode 5, I’m started to get bored of YSSS and doubt if I should give up. Funny that I got addicted to Relic of an Emissary but bored of YSSS. I really don’t like Moses’s character so far in this show. Was his character supposed to be created to be disliked? that may be your opinion but I think that’s his character. his character is sorta like his character in Moonlight Resonance. Michael! I agree with you! Well, i’m about to give up on Yes Sir Sorry Sir after Ron appears. I’m starting to get bored of it….. I don’t like Moses’s character in this series. I don’t know if I should compared his character to Where in the Legend Begins and The Battle Against evil because I hate his character in there. I dislike Moses character in YSSS because it looks too silly to me and I was also thinking “Was his character was created to be dislike”. I like Ron as an actor but I don’t like his role in here. At first when I watched this series i was like is this whole series about school or what. Where and when is gonna ron and linda appear since moses appear most of the time. I wish ron and linda would appear more in the show since the show get better since they appear.One thing surprise me the most is linda cold attitude.I was like WOW I like it.I don’t think linda would pair up with ron but i would like them to pair up in this series since i already seen ronxtavia and lindaxmoses but I haven’t seen ronxlinda. well so far good. I love this series… very fun to watch. BEST series of the year so far. Why are there so many complaints about this show. I personally find this show really fun and enjoying to watch it a lot. Comedy drama nowadays cannot even be compared to YSSS. Mosses did a very great job on his role and i don’t think any other actor can play that role better than him nowadays. Also I really liked Linda’s costume and hairstyle a lot. I prefer Linda pairing up with Mosses than Tavia this time time around because Linda is more adorable to me in this series or maybe it’s just my thought. moses is reallllllyyyyy getting on my nerves. what a jerk. so very silly and damn selfish. ive stopped watching it completely for now. crappy story line. Anyone thinks Ron is really annoying in this series too? I’m just going to continue and if this series doesn’t pick up then i’ll quit. This series is a good series to watch when you are bored. It is getting more silly with Moses too haha. So far I’m almost up to the point where the undercover thing with Moses is over. I feel REALLY bad for Linda now. She’s been hurt by Law Sir a couple of times and I really wish she had the cool attitude again. That’s what I like the most about her: being “cool”. But I can tell Linda actually improved a lot and she might have a chance of winning the Best Supporting Actress award or Favorite Female. Tavia’s character is okay. I enjoy it but it’s not as enjoyable as watching Linda. To be honest, I was hoping Tavia and Ron to be a couple, since they both have this great determination in them and I think that they’ll make a good match. Me too lo! Moses really hurt Linda alot! Hate it when seeing her cry! Today, I finally get to watch the episode where the dramatic scene happens. Law Sir finally finishes his case. And Linda got hurt really badly. I cried for Linda 🙁 All she wanted was a happy family and now it’s just so sad that Moses hurt her so much. I got to say that Linda really improved a lot and she really deserves an award this year!!! Have you finished the last episode? I’m looking for all the english in YSSS.I need the song name and the singer name.Thanks. I also like to see Linda and Moses together and Ron and Travia together. If Moses ended with Travia, I will be really disappointed. This is just a simple drama and the director/producer tried to make it so complicated. Anyone knows the title of the english song in ep 22 when tavia went to visit her brother in the hospital in germany? It’s a very nice song. Pls help!! Tks. OMG I just watch the preview for the final episode and I can’t believe Kenneth Ma is going to guest star!!! Why are you calling Law Sir a bad man? His two-timing was required by his superior officer. Plus, he never intended to cheat on Miss Koo. But I think Law Sir’s case is justifiable. It was necessary to make a few concessions in order to bring a massive drug-dealing triad down. One woman suffers, saving the lives of many students, which was worth it, in my opinion. Law Sir also suffers mentally; it’s not being selfish, it’s being selfless. The ending was reasonable. I don’t see Linda with Moses at the end. How could she be with someone who put her sister in jail and lied and betray her (whatever the reason). So I think the ending is reasonable and a good ending for everyone. For me, Linda’s character Miss Koo was for sure the highlight of the drama. Her entrance in ep 8 till the end made it very interesting to watch for me. I didn’t like watching the students either- this is definately not my type of drama.. Overall, I wouldn’t recommend this series and particularly don’t think it deserves the high ratings it garnered. Finally…i finished watching this series…i totally agreed with most people that this series is pretty boring and flat…the storyline is pretty expected and sometimes a little too far fetched. Here are some of my comments on this series…. I felt that Moses and Tavia characters are pretty monotonous…they do not really shine in here… and the characters they played are most likely i will forget as time goes by…although moses character are supposed to be funny, i do laugh a bit here and there, but i felt that he repetitively used the same method (eg raising his voice for no particular reason, be a sickly person when situation occurs) over and over again….boring….although this is just a series, i felt that moses should try to add more new stuffs in here to make it more lively….another thing is that he should not have started another relationship with Tavia when he was still undercover dating with Linda…that is very annoying each time i see how he tried to be with Tavia lying to Linda….of course i do understand if we do not have this storyline, there wont be much climax in this series….. Overall i would not really recommend this series to anyone unless they are a big fan of Linda or teacher-student story….For me personally i am a little disappointed with this series as i have high expectation in here since a year ago… ironically i am glad that i did watch this but just that it took me a long time to finish it for Linda and the sister/brother-in-law plot….. I agree with your comments from what I’ve seen from the series 🙂 I like the brother-in law & sister too. Other than that, not really much else worth mentioning..
How can u guys like the bro-in law??? Yes i c he does notice she’s cold n get the assistant to give her a scarf n other little things he picks up on. BUT common people!!! He cheated on her!!! His probably been cheating on her for many years and get away with it coz he doesn’t develop a relationship with the 3rd party. he just has 1 night stands and tell the 3rd party to leave him alone after that.. What a prick!!! !